The idea of combining two of my favourite things- ramen and chocolate- had been brewing for some time. When I got my Kitchenaid spiralizer for Christmas I realised using it to make pear noodles and topping it with a rich chocolate sauce would make a fantastic dessert. The addition of white miso gives a slightly salty taste which helps bring out the chocolatey flavour. I make no apologies for this being a full fat rich pudding. I really believe that if you try to eat healthily, the occasional treat will do you no harm. 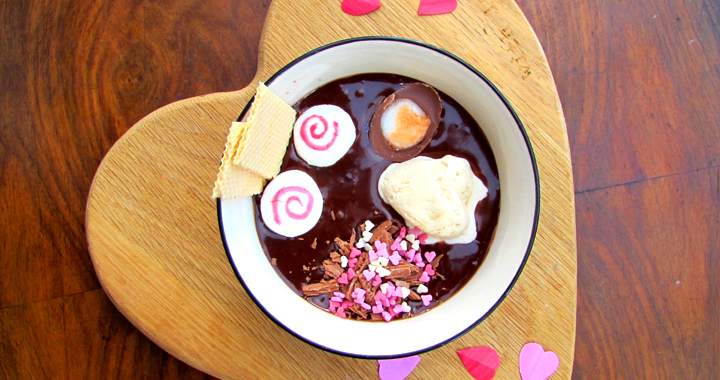 I topped my chocolate ramen with different sweet things to make it look more like a bowl of ramen, but you dress it up with as much- or as little- as you like! This is perfect for a luxury pud for a romantic Valentines meal for two. Please note: if you don’t have a spiralizer, use a peeler to create ribbons of pear and then slice each of these lengthways into noodle sized pieces. Also– Don’t make this too far ahead of time or your chocolate sauce will start to separate! Peel the pears and spiralize using the smallest cutter. Transfer the noodles to a saucepan and add the water, sugar and vanilla extract. Bring to the boil, stir and reduce the heat to low. Cover with a lid and poach for 10-15 minutes. Drain the noodles really well and transfer to 2 small serving bowls to cool. Add the cream, chocolate and miso to a small non-stick saucepan and heat gently. Stir constantly to make sure it doesn’t burn. Once all the chocolate is melted and the sauce is glossy, remove from the heat. Allow the sauce to cool for 10 minutes and then pour over the pear noodles. Add your toppings and serve immediately. Posted in Recipes, Sweets and Desserts, Uncategorised and tagged Chocolate, Desserts, Miso, Ramen.